I lived about an hour away from the King & Bear when it was being finished in 2000. At the time, the co-design of this new course between Jack Nicklaus and Arnold Palmer was a big, one of a kind deal — curiosity was high and the PR rollout was in full gear. Such a prospect was and remains interesting. How did the process work, and who did what? Given the operational size and status of the two signatories, it was never going to be an immersive collaboration. Jack and Arnie weren’t going to spend days together stomping around the property, sketching green sites and alternate routings and “trading” holes the way Tom Doak and Bill Coore did when they were piecing together the Blue and Red courses at Streamsong. 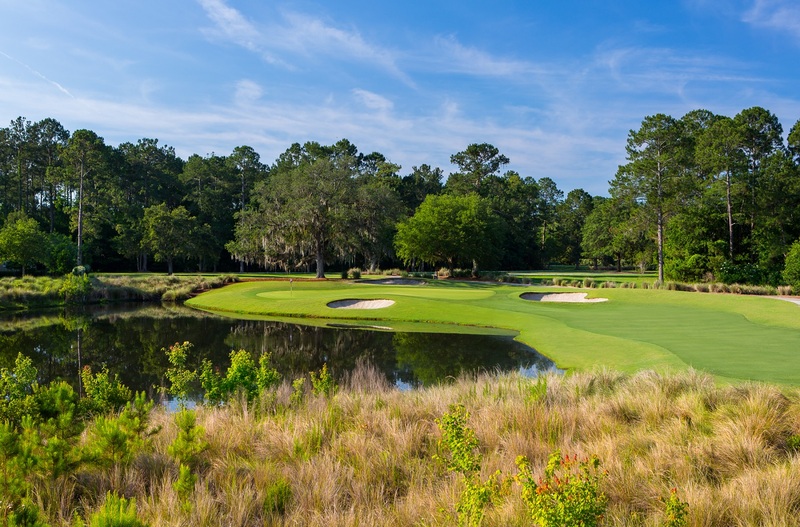 Playing through a former pasture surrounded by forested wetlands a few miles down a country road from World Golf Village outside of St. Augustine, there was virtually no natural topography to analyze. 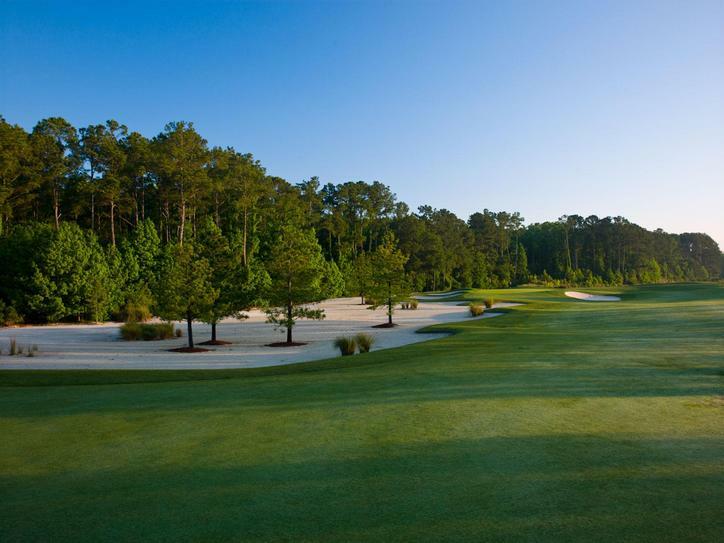 The routing’s biggest consideration involved the creation of a series of lagoons and the housing development that now occupies the former open space between the holes, and the only area of the course that retains any natural appeal is where 16, 17 and 18 turn through a section of live oak along the edge of a wooded marsh. More than anything King & Bear is a co-construction by two different design firms, with teams of associates hammering out variations of old standards and their own house styles, often on the same hole. From Palmer we get numerous beach bunkers that slide down into water and coquina rock walls bolstering greens along the edge of lakes. Nicklaus contributed the modern interpretation of “pot” bunkers it had been using — circular recessed bunkers that collect balls and play larger than their size. Rolled green perimeters and runoffs areas like at the par-3 3rd preview the softer shaping the firm would continue to develop over the next decade. As expected from companies owned by Hall of Famers with 25 combined majors — men with no small amount of ego observing closely the work of the other — there’s a lot going on here. Considerable attention is given to rewarding skilled play. Nearly every drive calls for an obvious fade or draw and clear advantages are awarded for power drives and aggressive lines of attack. 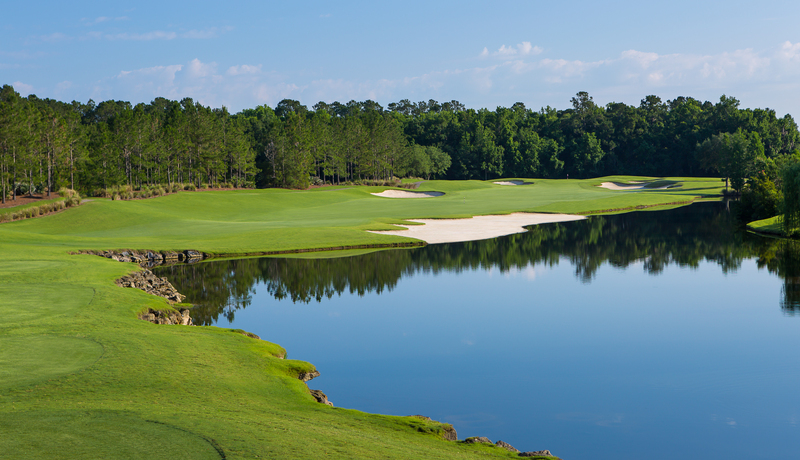 For example, the 5th and 7th two rather charmless but highly tactical par-5’s that slice and hook nearly 90-degrees around lakes (think: Bay Hill), might appear to tempt players to sail second shots over the water to reach protected greens, but only the biggest hitters would even consider it. There is a satisfying degree of execution in the shaping and finish work — these aren’t enormously successful companies for no reason. The last three holes are quite good, including the pretty par-5 18th that offers a shortcut to a perched green across a sandy wash that’s far more forgiving than the heroic carries needed at 5 and 7. There are also some very good green complexes and contouring (but, please, no more binary, split-level surfaces), some deep bunkers and some exciting things to look at, and I suspect most visitors to World Golf Village will find the visual aesthetic appropriately rewarding. That’s great for a resort and Hall of Fame that’s always struggled to find its audience. Having one of its two courses lit up by the Nicklaus/Palmer design imprimatur is a savvy move, and many players will choose to come here for that reason alone. 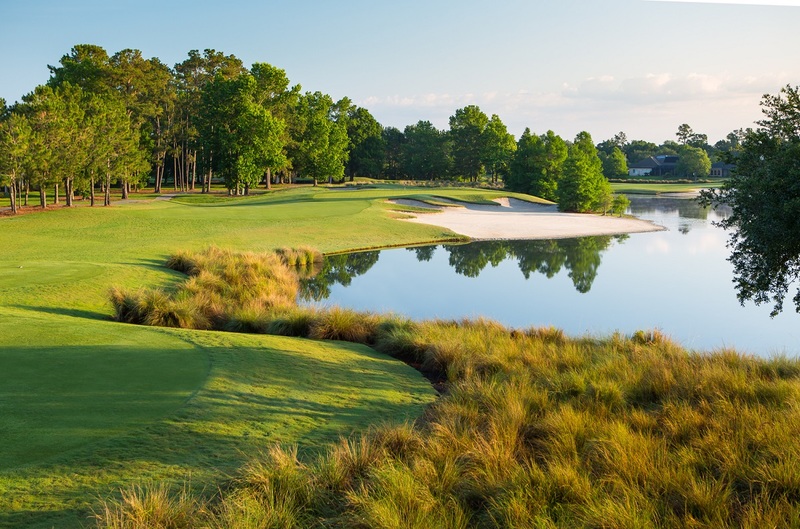 The lovely par-3 11th blends many things: the site’s wonderful live oaks, man-made lagoons, crisp bunkering and a bi-level green.